The best sellers don’t rely solely on the citywide Master List to get the word out—they’re proactive, and take a few extra steps to get info about their sale out to the public. Why is online promotion of your sale worth your time? Because on citywide weekend, shoppers have literally hundreds of sales to choose from. They can’t possibly hit them all and they’ll need to make choices with their time. You want your sale to be on their “must-visit” list. Here’s how to do it. Some of the Facebook groups where you’ll want to promote your sale may be closed, so you’ll need to request to be added. Allow a few days for your request to be granted. So in other words, read through this post about a week ahead of time, and then go back just before your sale starts to actually post your sale online. There are two main platforms for promoting your sale online: Craigslist and Facebook. Craigslist is pretty easy; one post and you’re done. Facebook is more complicated. Please be sure your posting includes your address and your hours! If you aren’t willing to accommodate offers for merchandise on your Facebook/Craigslist post, include that too. Something like, “No online sales, please visit sale in person” would do the trick. Best bet: Finish setting up your sale, then photograph the tables and merchandise all neatly set up and organized. Like we said in a previous post, a disorganized sale has a negative effect on sales. Make everything look organized and shoppers will have faith that your merchandise is equally well-taken-care-of. Start at the Iowa City area Craigslist site. Fill in the information, upload your photos, and voila! You’re done. Nice work. Now, for the harder part. This is by no means a complete list; there are a boatload of these groups, I tell ya. I tried to find the greatest hits for you, but if you’d like to spread the word farther, just search ‘buy/sell’ or ‘garage sale’ on Facebook to find others. This one really is a stellar garage sale post. She even went above and beyond by pricing individual items! Otherwise though, she nailed it. LOTS of photos, a nice big description, and tons of detail. Hours, address, and all the right info. GOOD WORK, SELLER. 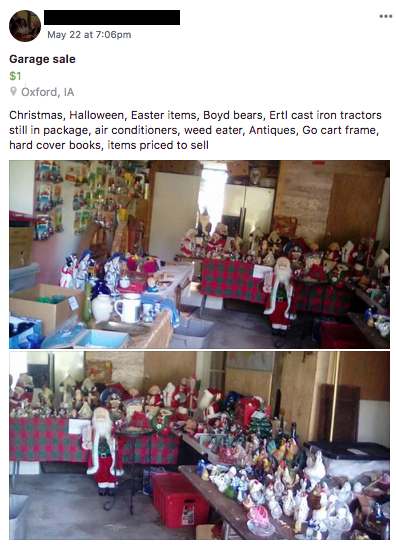 In addition to this “far back” shot, I would have suggested she take closer photos so folks can see specific items for sale. 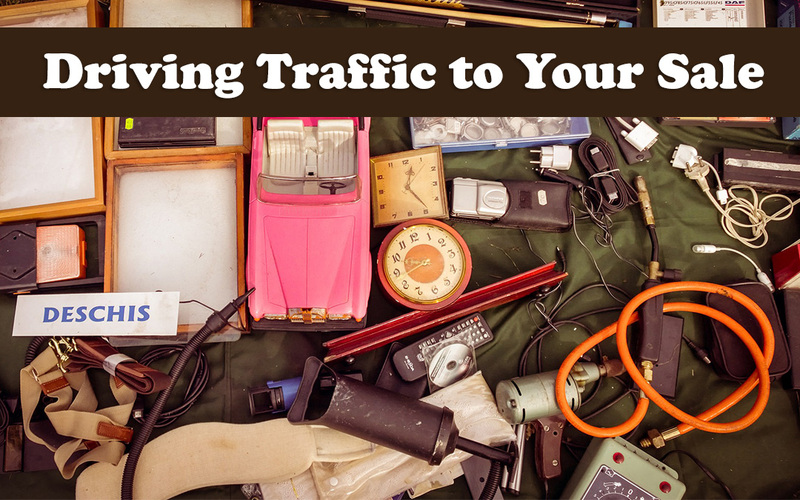 Folks are usually looking for something in particular, so seeing an item they’re in the market for will pique their interest.